DART faces the possibility of having to scale back service on the D-Line Downtown Shuttle if the State of Iowa cuts funding for public transportation. The D-Line would continue to operate through downtown and in the East Village, but without state funding, it would no longer travel up the hill to the Capitol and through the Capitol Complex. In addition, state employees might lose their benefit of free public transit on DART if the state ends its participation in DART’s Unlimited Access program. The program enables several of the region’s largest employees to give their employees an incentive to use alternative transportation as a means to improve the environment and reduce traffic congestion throughout the metro. The committee will also accept written testimony. The D-Line is currently funded through a public-private partnership between DART, the State of Iowa, and the business community through the Downtown Community Alliance. Its success has been sustained since its launch in 2008, with average monthly ridership exceeding 15,000 rides. Local business owners say the D-Line has improved their sales by making it easier for people to get travel throughout downtown without the time and hassle of taking short car trips. 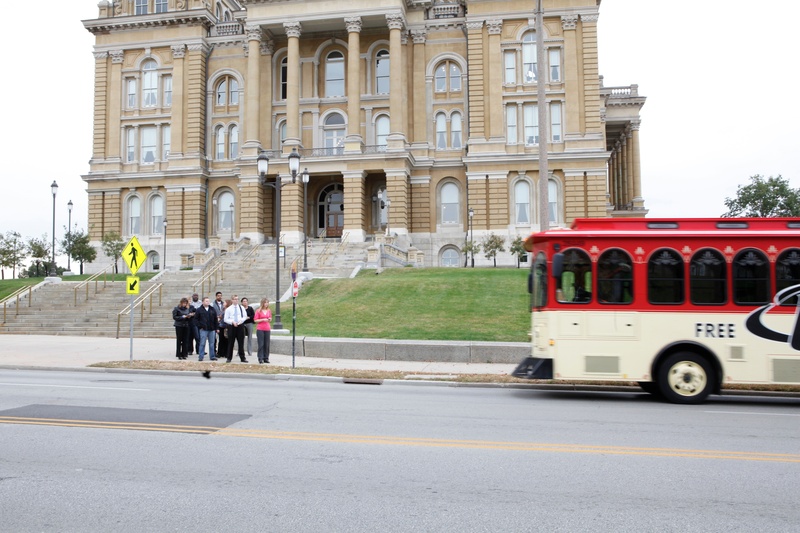 The state identified a daytime shuttle such as the D-Line in its Iowa Capitol Complex Master Plan as a means for achieving its objective of increasing mobility on the complex, where available parking spots few and far between. By traveling up the hill, the D-Line connects multiple parking garages throughout downtown and in the East Village with the Capitol Complex. This entry was posted in D-Line downtown shuttle, in the news by DART. Bookmark the permalink.